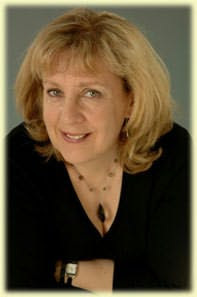 Continuing with Elizabeth Chadwick week, we are very excited to welcome Elizabeth Chadwick herself to Historical Tapestry! How did your interest in the medieval period begin, and how did that lead into writing books set in that period? When I was eight we had a teacher at school who used to get us to dress up as the historical characters we had just learned about and act out their stories in front of our classmates. We were doing the medieval period at the time, so I guess this was the first ever spark. After that, I fell in love with a crusader knight on a children's TV programme and began writing a story set in those times. Once I'd written on story, I was hooked and started straight on the next! The more research I did on the period, the more interested I became. You spend some of your free time doing medieval reenactments. How does this help your research? It gives me a 'hands on' feel for the period. It's all very well to look at an artefact in a book or in a glass case at a museum, quite another to use it as it would have been used in the period. I know what it looks like to peer through the eye slits in a jousting helm. I know how it feels to spin raw wool on a spindle. I know how it feels to climb castle stairs in a pair of heel-less goatskin shoes. It's absolutely priceless research for bringing the 'feel' into my novels. Could you see yourself living in that time, and if so what would be the things from the modern world that you would miss most? Any amusing stories you care to share from reenactment? I would love to go back for say a fortnight's holiday once a year, varying the seasons so I'd get a feel for them, and I'd spend most of my time as either a noble or a merchant. One day as a peasant for the experience would be enough each time! I would definitely miss chocolate, flushing toilets and clean, bright light at the flick of a switch. Then again, if the night was clear, I'd get to see the stars in all their beauty. I think one of the funniest things that has happened in re-enactment was when one of our members got his head stuck inside his helmet in exactly the same way that William Marshal did in his jousting days. Our man had to put his head down on the table and be carefully prised out of the helm by a blacksmith in a near repetition of an event that happened 800 years ago! If you could be one historical person, who would you choose to be? William Marshal's wife Isabelle de Clare definitely! Ummm....apart from the ten children! I could do without those. Over the years your books have changed a little in tone from being romances with a lot of history, to historicals with a bit of romance. What prompted that change in style? Partly it was a natural progression as I grew more confident with the historical material. I found myself wanting to write about real people. Partly it was market forces as historical novels moved in that direction. I had no desire to swim against the tide. Indeed, it was a catalyst. I still love my more romantic novels, but I thoroughly enjoy writing fiction about characters who lived too. Your books have been quite successful in the United Kingdom and other countries. What does it mean to you to have The Greatest Knight released in the US by Sourcebooks? It is wonderful to finally have a USA paperback publisher, and one as keen and dedicated as Sourcebooks. I have received hundreds of e-mails from USA readers asking why they can't obtain my novels in the States. Now they can. Sourcebooks are real innovators in the marketplace and going from strength to strength, so I couldn't be more pleased, I hope the readers are too and I promise to do my best for them. 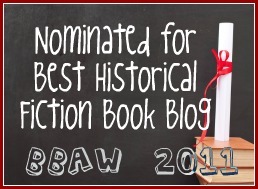 Do you see yourself continuing to write about the Marshals and their contemporaries or do you have some other characters or period that you are looking to write about? Beyond The Greatest Knight I have written several novels continuing the story of the Marshals and their contemporaries. Sourcebooks will publish the follow up to The Greatest Knight in spring 2010 - The Scarlet Lion and also in the UK in spring 2010, Little Brown is publishing To Defy a King, the story of William's daughter and her conflict-filled life. Just now I am starting a novel on The Empress Matilda and her stepmother Queen Adeliza. The latter was actually the same age as Matilda. It's likely title is Lady of the English, and it will look at the lives of these women up close and personal. I'm keen to get properly going on it. Looking at the characters in The Greatest Knight, Richard de Clare certainly captured the attention of a few readers. Did you ever feel compelled to write his story? Are there are other secondary characters that you would like to have the chance to focus on a some stage? I did think about writing about Richard de Clare at one point, but as you know, I like to write novels spanning the years. Richard marred Aoife McMurrough, begot a son and Isabelle, and promptly went and died when they were tiny, so his life story would have to be his early life and the fight for Leinster. I feel that his story arc was a little too short for my purposes. Secondary characters quite often suggest stories, or at least story lines. but for the moment I have a fairly full agenda with what I've got. I confess that I became very interested in Wigain, the clerk of the Young King's kitchen. I found him in a chronicle, lurking with various high born bishops and the like. He'd obviously been on an important mission somewhere. What was he doing? What was he up to? A common kitchen clerk in such exalted company? So it's not always the big names I wonder about. At some point I'd love to write 'Wigain's tale.'! What's next for Elizabeth Chadwick? 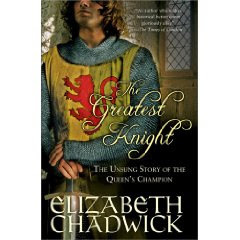 Don't forget that you can win Elizabeth Chadwick books! Full details can be found on Monday's post! Click here! Oooh, I can't wait for that novel about the Empress Matilda! I first encountered her in Penman's "When Christ and His Saints Slept" and have always wanted to read more about her. Thank you so much for being on H.T. again! "Our man had to put his head down on the table and be carefully prised out of the helm by a blacksmith in a near repetition of an event that happened 800 years ago!" LOL! Poor guy. I am so looking forward to reading your books. My buddies here at HT have convinced me. I think I will especiaslly like your more recent works as I don't read too many books where romance is the central them. I tried to get a review copy of The Greatest Knight but was too late. I will have to get it as I am sure I will enjoy it. I'm impressed with the depth of Elizabeth's knowledge. So much so that I posted the link to this interview over at Win a Book. Elizabeth deserves more fans; heck, she just made me into one!